Since I have cut dairy out of my diet, I am feeling great, no stomach aches, lost 6lbs and I am having fun finding new things to try. I am pretty adventurous when it comes to trying new foods. Some a hit, like today’s ingredients and other things a flop! But I am having fun doing it! Sounds weird, but I’m a total foodie and I just LOVE trying new foods! While I was venturing out looking for dairy free drinks and yogurt, I found two items I just had to buy! 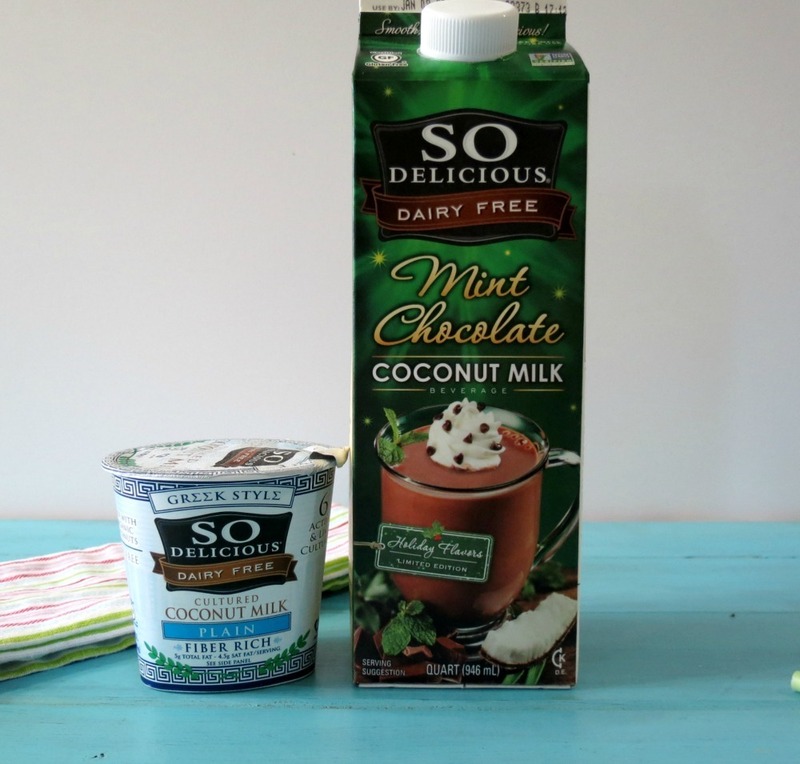 Oh my gosh the Mint Chocolate Coconut Milk is to die for! 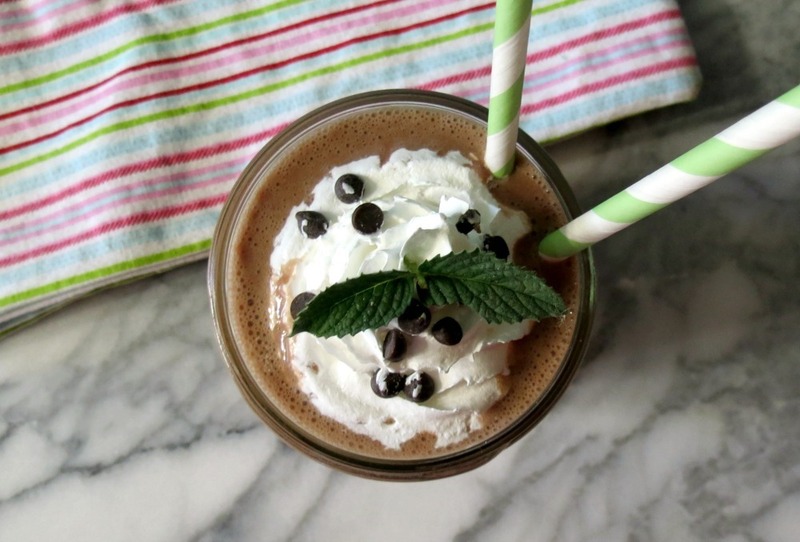 It’s so creamy, chocolaty and just the perfect hint of mint! The yogurt is amazing too, and mixes well in my smoothies. Plus it has 9 grams of fiber! 9!! That’s crazy! 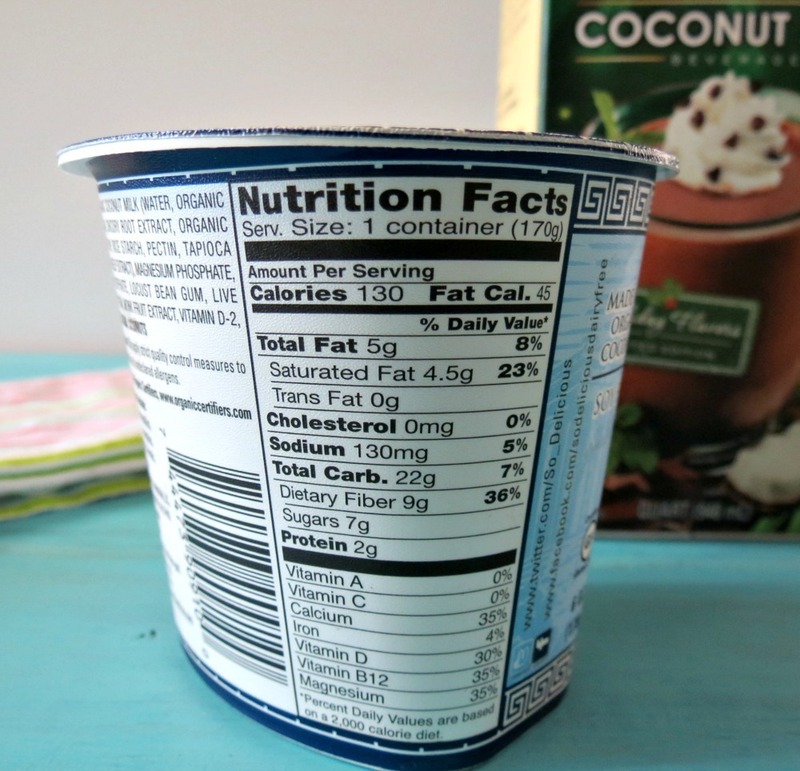 So if you’re lacking in fiber, you should try this yogurt out. I bought plain because I was planning on mixing other things in it, but they do come in other flavors. Check out the stats! I still can’t get over 9 grams of fiber! With the combination of these two ingredients, plus a frozen banana, I made the most amazing smoothie!! This smoothie is friggen delicious!! It’s creamy, thick, very filling and loaded with great nutrition and healthy fat! Healthy fat is great for the skin and hair! Since I have been consuming a little more fat in my diet, I kid you not, my hair is shiny and soft. I color my hair (please don’t tell anyone) and having non-frizzy hair for a change is just wonderful. Even little Jenny said how is your hair so nice? You color it and it’s normally on the dry side. I credit healthy fat to that!! Thank you coconut and peanut butter! Even though the smoothie is made with all coconut ingredients,except for the banana, you don’t taste the coconut at all. You wouldn’t even know that it is dairy free and vegan. I even used dairy free whip cream and chocolate chips. It’s amazing how far we have come with ingredients. 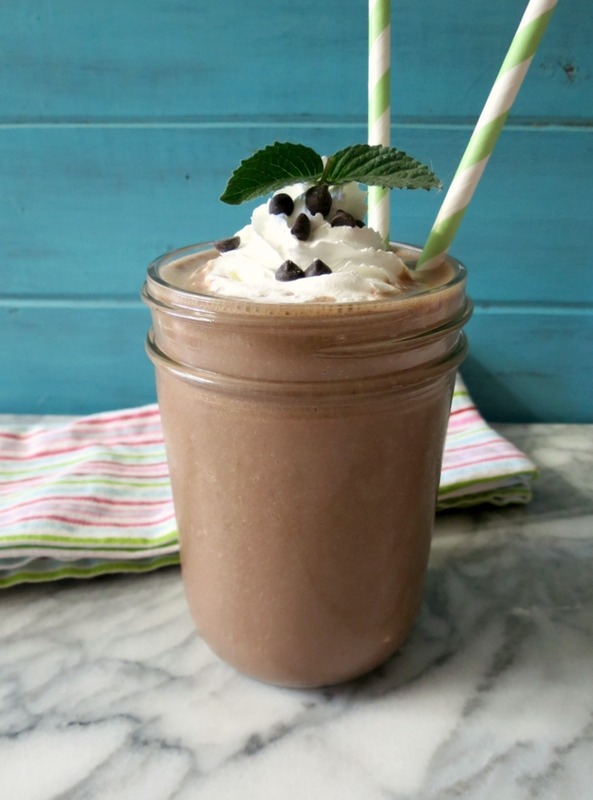 I have to tell you I just made this smoothie, downloaded the pictures and I feel like my stomach is going to explode. I am soooooo full! I guess that’s a good thing! That means I won’t be snacking this evening! To make the smoothie, I just added all my ingredients in a blender and processed it until it was creamy smooth. To thicken it up a bit I added xanthum gum. You guys told me over a year ago to try xanthum gum in my smoothies and I have to thank you for that! My drinks don’t separate and it’s nice and thick. Xanthum Gum is a little pricy, $13.00 a bag, but I am still using the same bag from over a year ago, well worth the money. An 1/8th of a teaspoon is all you need. However you don’t need it in any of my drinks, but I use it mostly for pictures. Oh and if you happen to buy it, keep it in the fridge for fresh keeping! Just in case you’re wondering where you can find these ingredients, I found them at my local grocery store, but I saw them at Target on Saturday. They even make coconut milk in Pumpkin Spice and Eggnog. That is great for the holidays. Plus it gives me more ideas for recipes, not just smoothies. I’m not pushing these ingredients, but I get so excited when I find a good thing! Plus I really LOVE coconut milk! I discovered it at Trader Joe’s over a year ago and I always keep a carton in my pantry. I’m kind of a coconut lover, if you couldn’t tell! 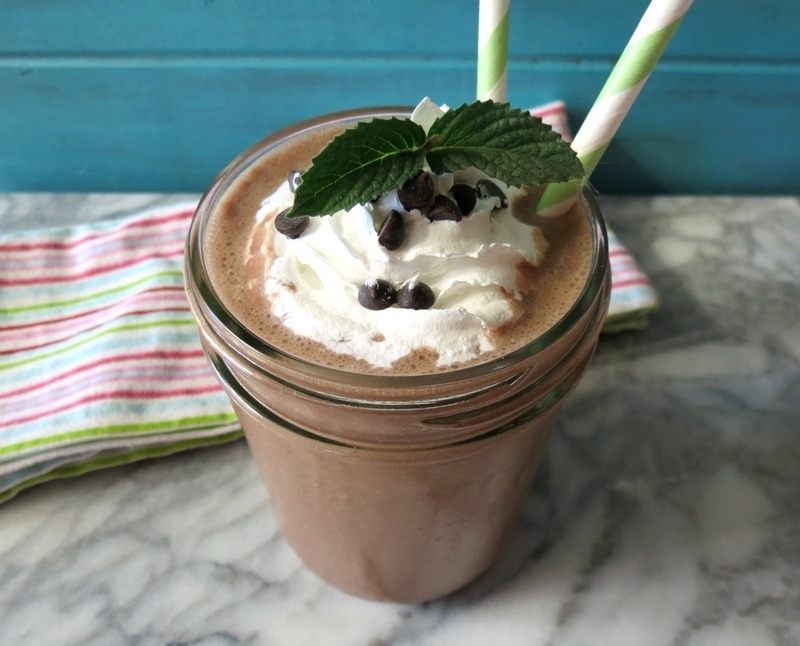 I do have to tell you I credit this smoothie to Starbucks! Ever since they debuted their peppermint mocha for the holidays, I have been on a MAJOR peppermint kick. I love peppermint! It is my favorite flavor this time of year. I don’t think I could ever get sick of it!! Mmmmm, peppermint!! Oh how I love thee!! 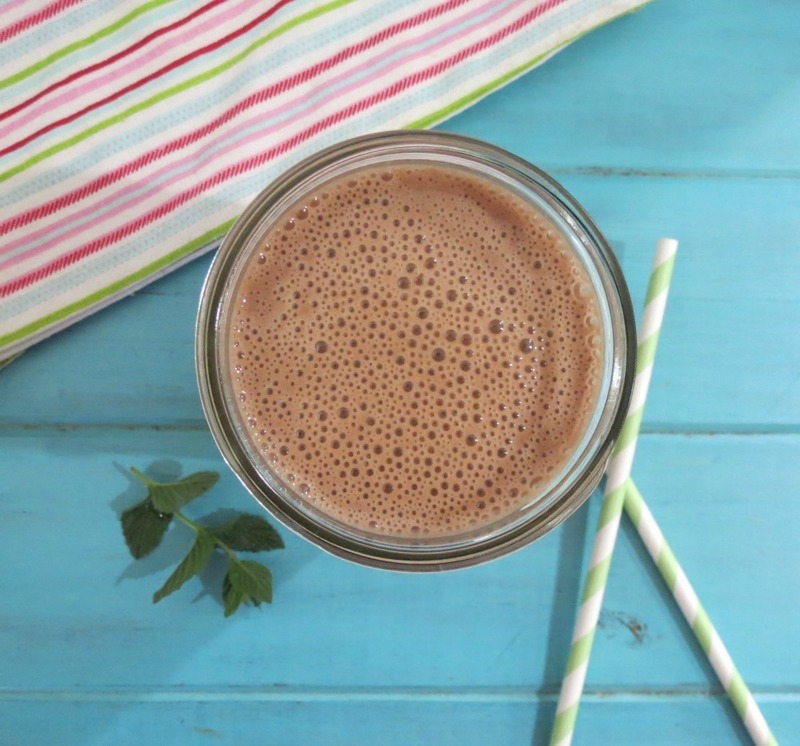 A healthy, creamy, sweet, dairy free drink blended with mint chocolate coconut milk and coconut yogurt. I’m still having a little bit of a hard time finding protein snacks. I always got my protein from yogurt, so I have been upping my meat intake at dinner, but it’s still not enough. I’m still learning and I’ll find my way. But I do have to show you something that I found! Don’t you love it? This is a hand made necklace that was made just for me! I just love it! It’s the name of my two babies and a little paw print. I love wearing this necklace. Whenever I am feeling a little sad, I look at it and smile! My dogs, no matter how crazy they are and how much they drive me nuts, steal my food and makes me bonkers, I love them! And you know what? I wouldn’t have it any other way! They are such characters and being able to wear their names around my neck just makes me happy!! Not only do I love my dogs! I love my Husband too! I could not just get a necklace for me, but I had to get one for him too. Now he doesn’t where necklaces, but I told him that this necklace will bring him good luck! I told him to put it in a safe place where he feels he needs it, like in his tool box at work, or in his glove compartment in his car or even near his pillow. He said he is taking it with him, when he knows he needs luck, but won’t use it everyday because he doesn’t want to wear the luck out. lol I gave him this necklace for our 8 year wedding anniversary that we celebrated a couple of weeks ago. He really loved the gift! I was contacted by Jasmine of bama + ry and she asked if I wanted her to make a necklace for me. I picked the dog one and I loved it so much that I bought the other one from her. There are so many options, not only does she makes necklaces, but she also makes earrings, cuffs, ornaments, charms, and key chains. 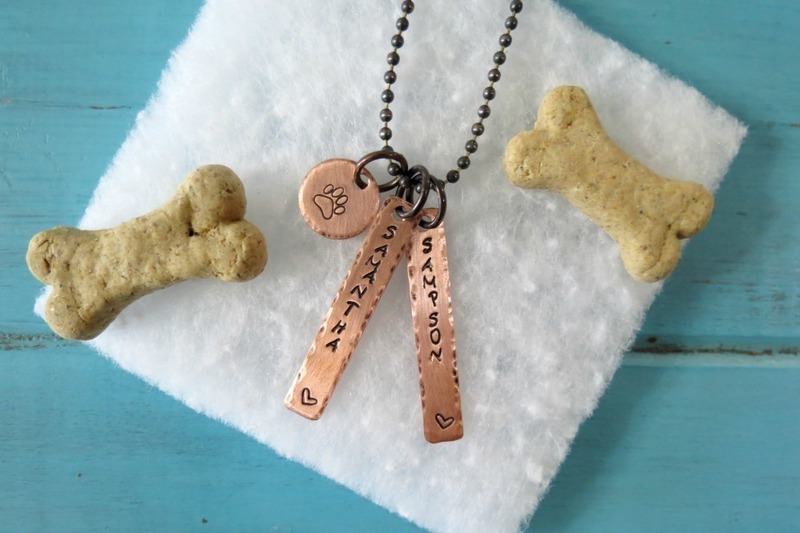 Jasmine makes custom jewelry to what you want. You could have a mother and daughter, I love coffee (he he), strength, love, children, inspiration and so much more. The possibilities are endless and you can have made what you want and love. I am sharing this with you because I really thought that this would make a wonderful Christmas present. Give it to your sister, mom, dad, friend, teacher or for yourself. It’s low price for custom-made jewelry, it beautifully packaged and I love that you can tell someone something without actually saying it. I personally have a hard time sharing my feelings. I may talk a lot and apparently loud, but I don’t know how to show emotion. I feel it, but it’s hard to share it. I’m working on that! Jasmine is also offering my readers a 20% discount, which makes the price even better! Your looking at anywhere from $5.00 to $40.00. Great prices for one of a kind piece that you won’t be able to get anywhere else. I want to give a big thank you to Jasmine for working with me (I can be a little annoying) and creating a necklace that I am proud to wear. 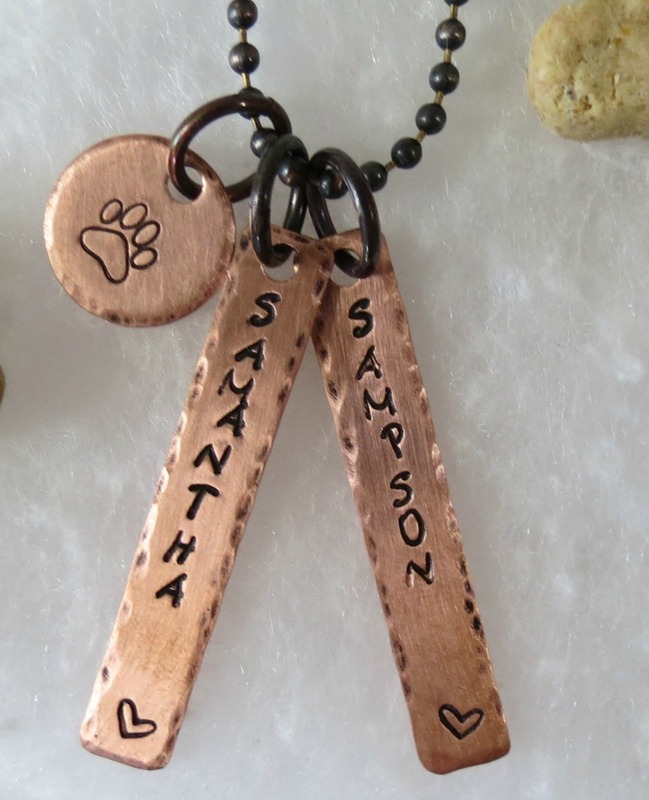 People just don’t understand why I have a necklace with the name Samantha and Sampson on it with a dog print. They think they are my kids and then I say nope, my dogs. I get a funny look, a giggle and then they smile. Hey! What can I say? I love my babies!! 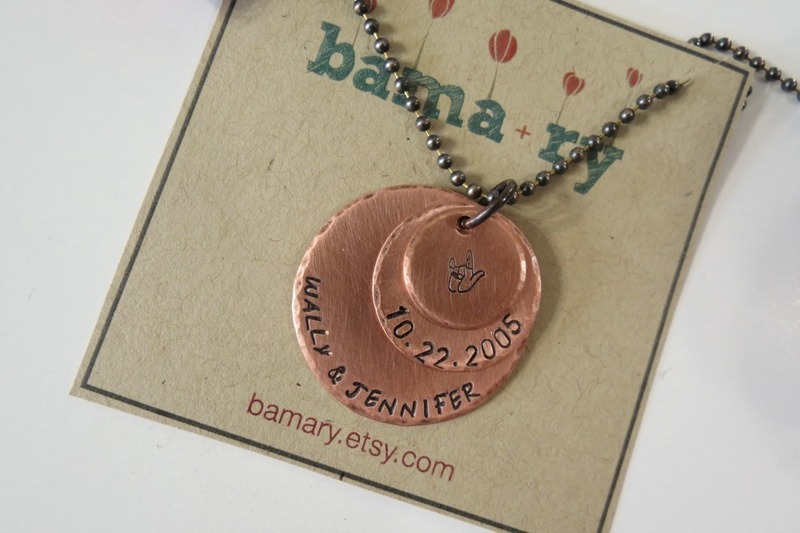 To check out bama + ry custom jewelry you can go to her Etsy shop here. Check it out! Tell Jasmine I said hi!! Have fun with it! Be creative and most of all be YOU! Love those necklaces AND that smoothie!! Thank you Marie! I love the necklaces! They are so fun! My sister is going to love this recipe!!! I wish I could try it, but coconut is a no no. Oddly, I’ve used soy and almond milks for the past 10 years, but now even they make me sick. My life has been sadly void of “milk” and cereal, since I found out I was pregnant last November. This recipe looks amazing though. I am going to share it with everyone, especially my sister. Thank you for the yumminess!!! Thanks for all the delicious dairy-free recipes! I’m lactose-intolerant as well, and it can be hard to find dishes that are dairy-free and still taste great, especially for the holiday season. I love So Delicious Coconut products, try the egg nog if you haven’t already! The eggnog is next on my list to try! That will be so perfect for the Christmas season! Can you believe we are already talking Christmas! That is so crazy! Looks so rich and creamy, who’d know there was no dairy? You are so inventive, Jennifer! Thank you so much Chris! Loving all the options out there! I am soooo glad your dairy free diet is working out for you! I have been obsessed I was having the same issues, though I am totally like one of those people that thinks I have a disease if someone mentions it! LOL! This coconut milk you discovered sounds soooooo good too! So glad you are finding some awesome options! I am so glad there are options out there too! It’s been fun finding new things to try and I am loving this coconut milk!! Thank you so much.for sharing! Since being diagnosed with thyroid cancer diet has been tough. This gives me more options! I am so sorry to hear about your thyroid cancer. Lucky we have options out there that we can eat!! This smoothie sounds delicious. I usually just heat up the mint chocolate by itself to make hot mint chocolate since I am the only one in my family who is allergic to milk. I’m the only one in my family too that is allergic to milk. Sometime sit can be difficult, but thank goodness for products like So Delicious! 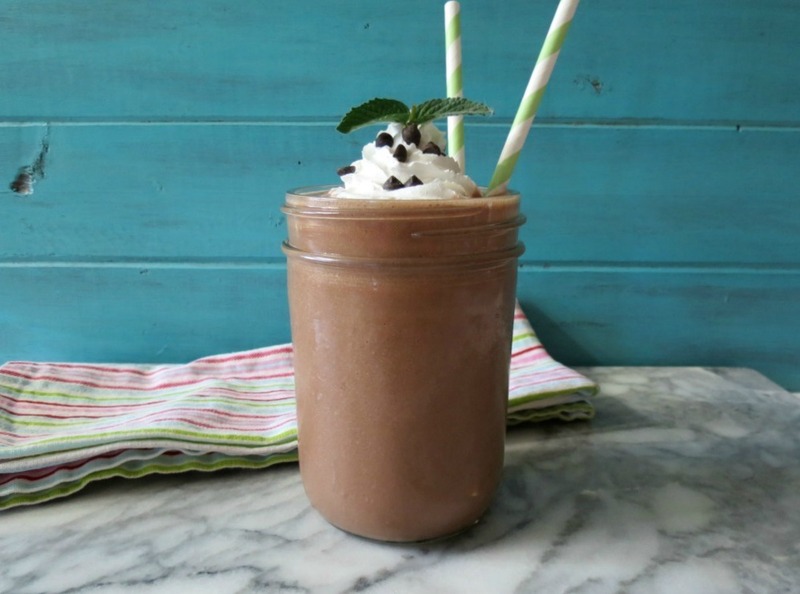 Whether your dairy free or not, this drink is for everyone! I am definitely going to make this!!! My fav and my nieces & nephew’s favorite flavor is mint! I am spending the weekend with them! Can’t wait!! YUM!! Oh my gosh, I am with your niece and nephew too! I love mint and can’t get enough of it, especially this time of year! Awesome idea! That would work great!! How can you use chocolate chips they have dairy in them ? I’ve never seen the mink chocolate milk. where did you buy it? Hi! I found it in the refidgerator section of my grocery store, Raley’s. However, I think Target carries it too! i like the smoothie and hope i can win the ingredients to try it. When I saw your smoothie I just had to come find out the details. 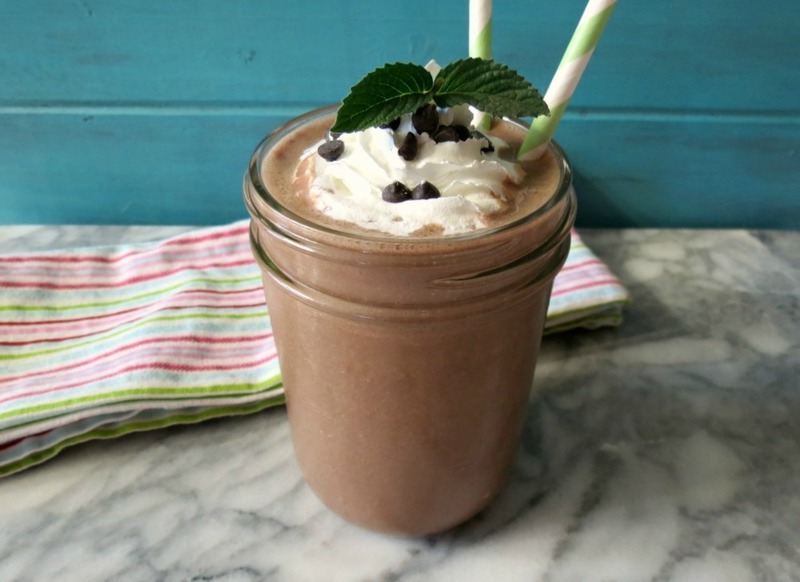 I am not a big smoothie drinker but this one I would most definitely like! It sounds extremely good and if it has chocolate I am in! Stopping by from Freedom Friday party. 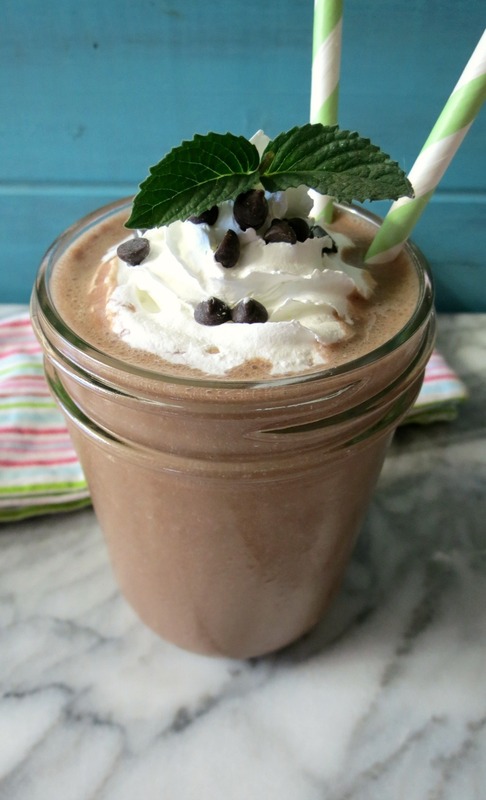 This smoothie is like dessert and tastes wonderful! SO perfect for this time of year!! Thank you for having me at Freedom Friday! Just pinned and I am definitely trying this!!! Thank you Evelyn. You have to let me know what you think! I have watched your site for some time and love what I have seen! Thank you!! I have been gluten free for over a year and dairy free almost a year but still feel new at that. I am finding it isn’t all that hard, however I miss cheese the most:). I know, cheese was the hardest thing to give up when I went dairy free for a month, which was kind of shocking, I thought it would have been the yogurt. I am still trying to limit my dairy, but I can’t completely. Going gluten free can be tough, but there are just so many options out there now, you just have to look for them. Good for you for sticking to it! !